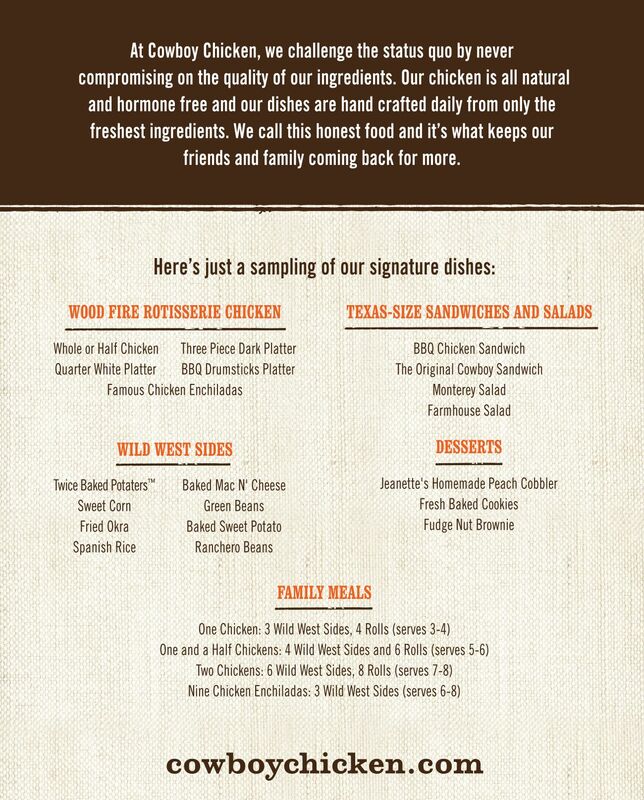 Wichita, KS (RestaurantNews.com) Cowboy Chicken, the fast casual restaurant known for its authentic, wood-fired rotisserie chicken and homemade sides opens its first Wichita restaurant on Wednesday, June 20. To introduce its mouthwatering menu and community spirit, the restaurant is cooking up a five-day Grand Opening Celebration complete with food specials, events and the chance to win free chicken for a year! The first 100 guests waiting in line when the restaurant opens at 11 a.m. on Wednesday, June 20, will be entered into a drawing, and five lucky winners will receive free chicken for a year. Must be 18 or older to win. For official giveaway rules, visit www.cowboychicken.com/sweepstakes-rules/. Wednesday, June 20 – Way-Back Wednesday: Cowboy Chicken is taking guests back to 1981 – the year the restaurant first opened – with original menu pricing on select items. Dine-in only. Thursday, June 21 – Dine to Donate: All day long, 25% of all proceeds are donated to the Wesley Children’s Foundation, which provides individual patient assistance to children and families during hospital stays. 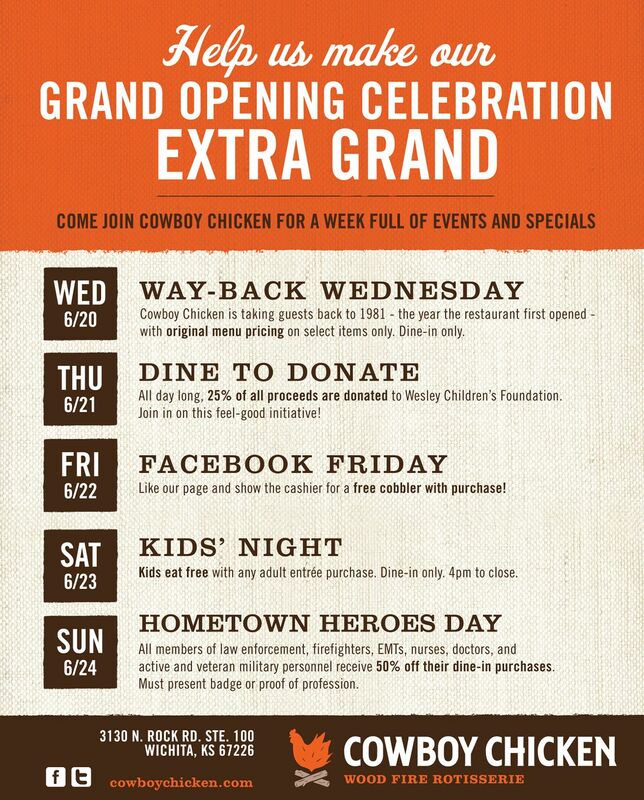 There will also be a ribbon cutting ceremony with the Wichita Regional Chamber of Commerce at 2 p.m.
Friday, June 22 – Facebook Friday: “Like” Cowboy Chicken Wichita on Facebook, show the cashier and receive a free cobbler with any purchase. Saturday, June 23 – Kids Night: Kids eat free beginning at 4 p.m. with any adult entrée purchase. Dine-in only. Sunday, June 24 – Hometown Heroes Day: All members of law enforcement, firefighters, EMTs, nurses, doctors, and active and veteran military personnel receive 50% off all dine-in purchases. Must present badge or proof of profession. Cowboy Chicken Wichita is located at 3130 N. Rock Road. The new 3,200-square foot restaurant centers on a large, wood-burning rotisserie where guests can view the chickens roasting from the rustic-meets-modern dining area. The restaurant serves lunch and dinner daily from 11 a.m. to 9 p.m. For more information, call 316-634-1599 or visit www.cowboychicken.com. This is the fourth Cowboy Chicken restaurant for FRC Group, which owns and operates locations in Manhattan, Kansas; Ankeny, Iowa; and Sioux Falls, South Dakota. The Omaha, Nebraska-based affiliate of Sun Capital Partners has entered into a franchise agreement to open a total of 14 Cowboy Chicken restaurants across Iowa, Kansas and South Dakota. Cowboy Chicken serves all-natural, hormone-free rotisserie chickens that are hand-seasoned in store, marinated for 24 hours and then slowly roasted for two hours over a real wood-burning fire. Hearty and healthy dishes are available during lunch and dinner for dine-in, take out, catering and delivery. On-the-go diners can order on the Cowboy Chicken app, available through the Apple App Store and Google Play Store, which allows guests to order ahead, pay with their phone at checkout and earn rewards. Founded in Dallas in 1981, Cowboy Chicken is a fast casual restaurant chain specializing in real wood-fired rotisserie chicken. The brand has been included in Fast Casual’s Top 100 Movers & Shakers list every year since 2012. In 2017, Cowboy Chicken was named one of the Future 50 Emerging Chains of the Year by Restaurant Business and one of the Top 25 Most Loved Brands by Foodable. Forbes magazine also chose Cowboy Chicken as one “Hot Restaurant Chain to Buy into Now.” Cowboy Chicken is currently seeking qualified franchisees to help build the brand in select markets across the U.S. For more information, visit www.cowboychicken.com or contact Kathy Davidson at kdavidson@cowboychicken.com.